Let’s talk about the 2 most used type of sidings. It is a blend of cellulose fibers, sand and cement. When it’s manufactured for siding, it resembles natural materials like wood and stone. Often called “hardiplank” or even “hardie board”, named from the most popular brand of fiber cement siding which is manufactured by James Hardie. This type of siding is known for durability, affordability and for being available in a variety of forms. It is installed in much the same way as traditional lapboard or wood siding, as it is nailed directly to your home. Vinyl is an invention of the 20th century, made of PVC or polyvinyl chloride. It has become very popular because it is durable, affordable and quick to install. Unlike fiber cement siding, it is not nailed directly to the side of your home, allowing it to expand and contract. Can look like cedar, stone or tile without the added costs and maintenance associated with organic materials. Shingles, vertical or horizontal planks, and faux log are the ways that Vinyl Siding can come in. How does each one look like? Both, fiber cement and vinyl siding, have come a long way from their origins. It’s possible to buy fiber cement boards as half-round, staggered or square shingles as well as in long plank boards. 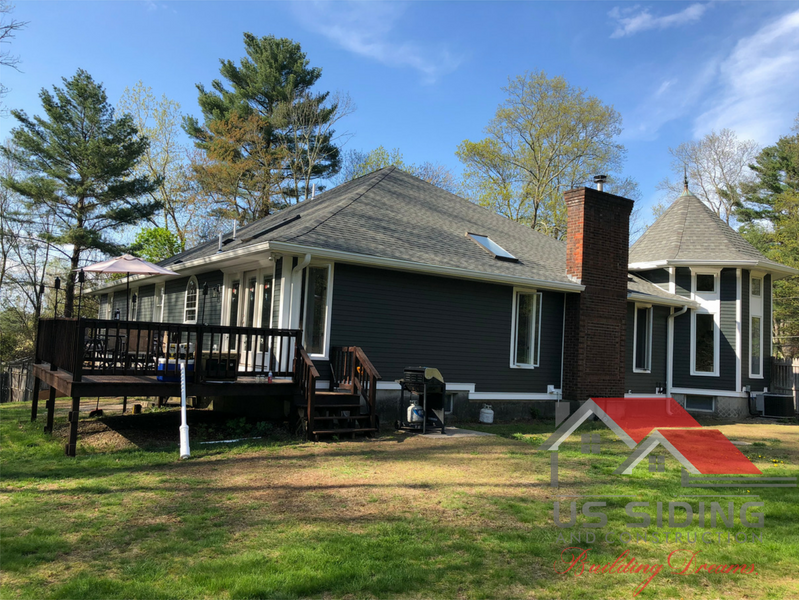 It can be painted or stained, which means you can make it any color you’d like and it’s also now possible to buy prepainted fiber cement siding in a range of colors so that you can eliminate this step. Vinyl siding offers a much greater variety of decorative options, from maintaining the appearance of an historic home to creating a clean and modern facade. In fact, no other siding option offers such a range of styles and colors. Available are not only the shingle and plank looks of fiber cement siding, but also a variety of panel designs including clapboard, board and batten and Dutch lap. Among the most popular vinyl siding products are those with a grain-finished surface that mimics real wood or those that look like cedar shake shingles. Certain vinyl siding panels can even be hung vertically for a unique and eye-catching look. On their own, both vinyl and fiber cement siding are relatively thin products that aren’t particularly good insulators, although they are both effective at keeping the elements away from your home. If you would like to increase your home’s energy efficiency there are vinyl siding options that come with a layer of insulation. Keep in mind that this insulated siding will keep warm air inside your home during the winter and keep the heat of the sun outside during the summer. Vinyl siding does absorb heat during the summer and an insulation layer will prevent that heat from transferring into your home. Both vinyl siding and fiber cement siding were invented as more durable alternatives to natural materials. Whether you are installing vinyl or fiber cement, you can generally expect to never have to install them again. That being said, vinyl is considered to be the MOST durable option. Fiber cement has one drawback. It does absorb moisture. That means if you are installing fiber cement and there is a place where moisture collects, that moisture could eventually damage your home, but in most standard situations, fiber cement should last 50 years or so. In fact, many fiber cement products come with lifetime guarantees. While vinyl siding, when installed properly, creates a tighter seal, remember, it does expand and contract. If there is an issue with your vinyl installation, this natural process can quickly become a problem. If it expands or contracts in such a way that a gap in the coverage appears, water can enter through that gap. Here’s where vinyl siding pulls way ahead of fiber cement. When fiber cement is installed, it needs to be caulked and painted (unless you opt for the prepainted version), unlike vinyl siding, which needs no additional work before or after installation. Additionally, fiber cement fades over time, so it means that you will need to paint your fiber cement again sometime in the future. Likewise, you’ll need to ensure that the caulking in the joints maintains its integrity to avoid water intrusion. In the case of vinyl siding, other than periodic cleaning and spot repairs in the event of inclement weather, vinyl is very low maintenance. In fact, most years, you will need little more than some soapy water and a garden hose to keep your vinyl siding in like new condition. Copyright © 2016 US Siding & Construction. All Rights Reserved.